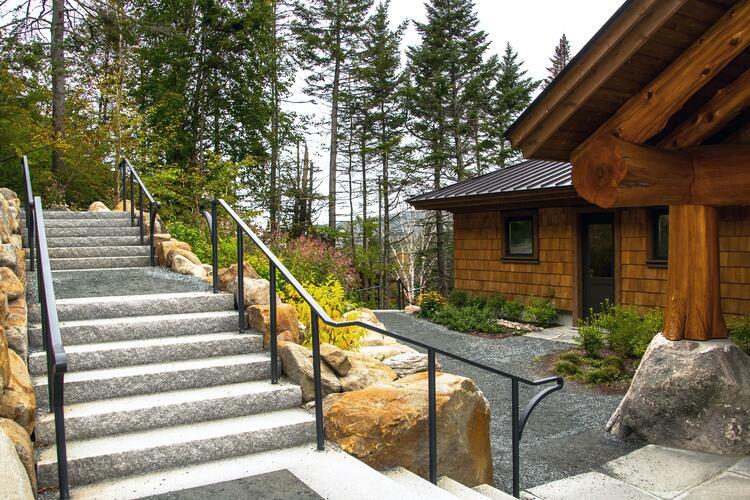 Woodbury Gray granite steps and irregular slabs outside the lodge.  Creating timeless and lasting designs with local materials is a challenge that Swenson Granite Works takes on with pride. 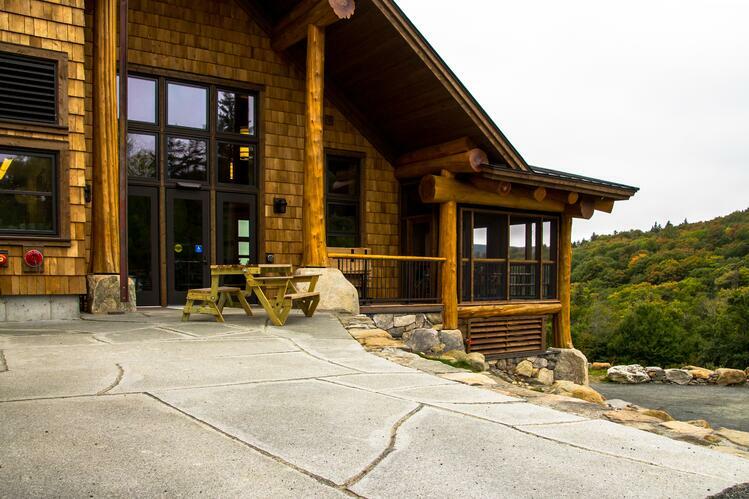 What makes a project like this even more satisfying for Swenson’s craftspeople is having the opportunity to work alongside other skilled professionals in the community. 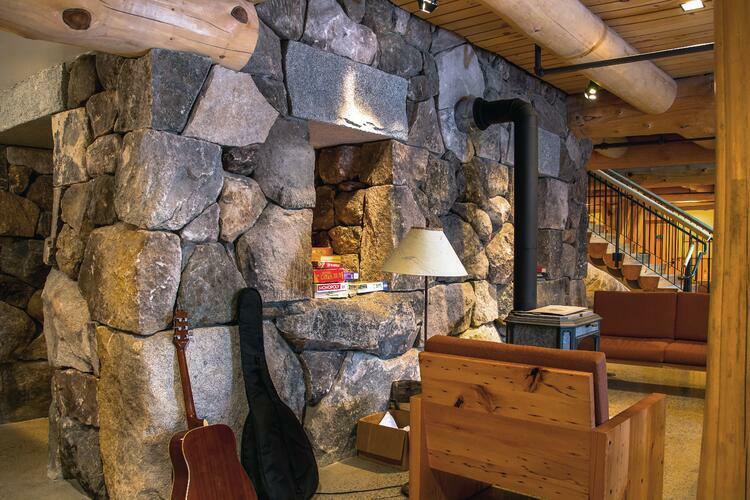 Standing in perfect contrast to the warmth of the lodge’s hand-carved wooden designs is Swenson’s cool, timeless Woodbury Gray granite used inside for the interior staircase, basement headers and fireplace hearth. Outside, the granite was used for the chimney cap, exterior steps, patio and walkway. Woodbury Gray granite steps go up to both of the atrium patio decks inside the building. There is also a staircase that runs through the large center chimney. 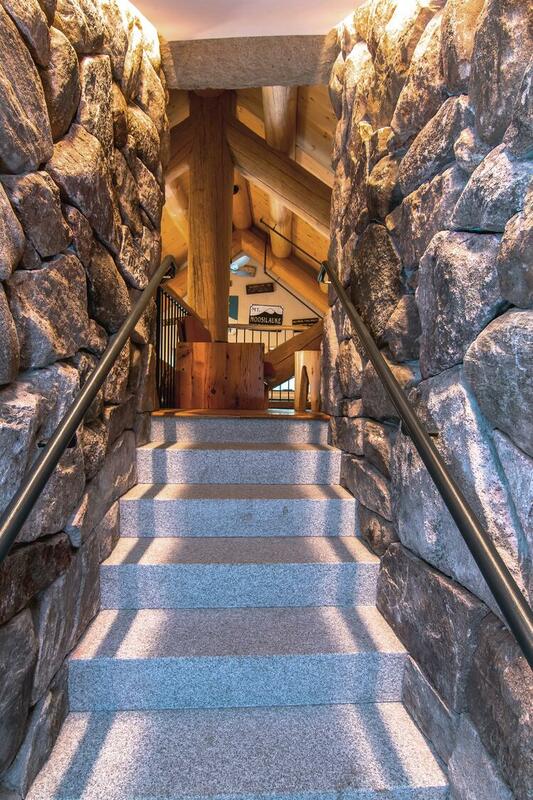 “The design for this staircase with Maclay Architects and Joe Rolfe of Stone Mountain Masonry was pretty awesome to say the least, as far as figuring out and calculating how we were going to make this work,” Ames said. The steps have a thermal chamfered front edge and had to be made a little bit longer to be built into the stonework. There were a lot of things to take into consideration, as the stairs go up, land, and then turn 90 degrees, then go up again 90 degrees to the right and then 90 degrees to the left. The staircase also slopes back on the bottom. 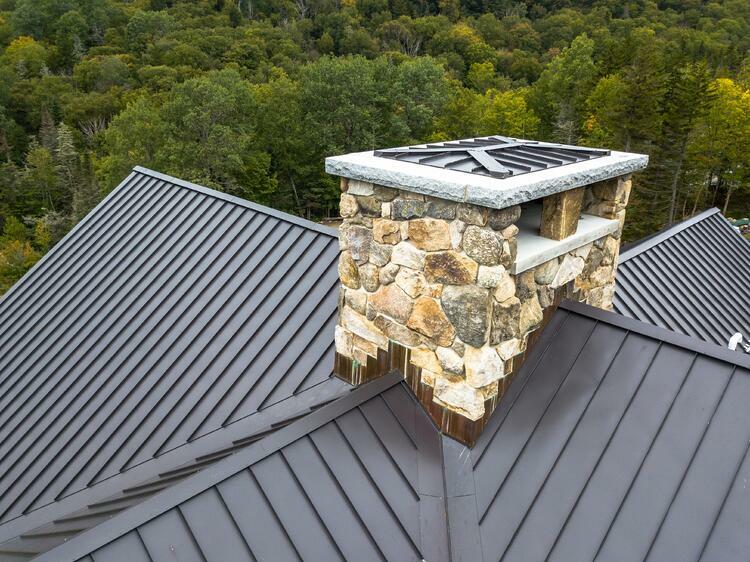 “It was imperative for us to make sure that they were made correctly so that each end or base that was visible was finished correctly with the same angle as well as the same radius nosing,” Ames said. Both of the landings needed to be installed first because it was impossible to get them into the structure after the stonework had begun. 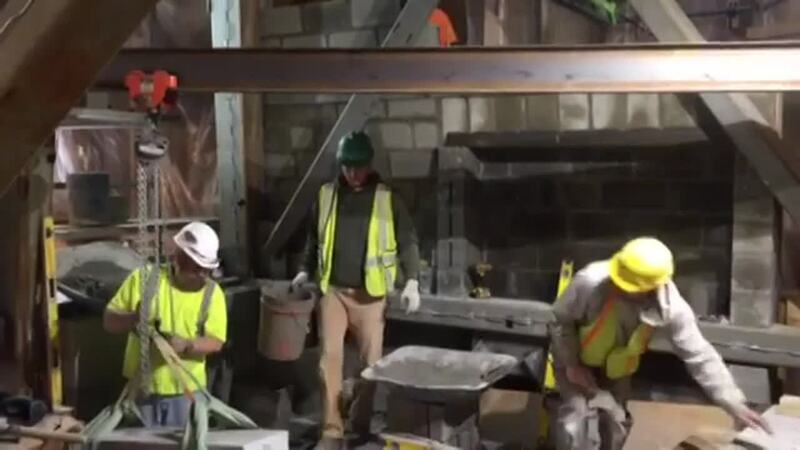 So Rolfe and his crew rolled them in on steel wheel dollies, got them into position, hoisted them with chains falls, propped them up with shoring, and then literally worked under them until they reached that point. Outside, irregular granite slabs were used for the patio and walkway. 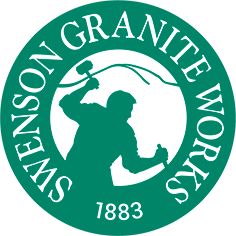 Landscape contractor Peter S. Jensen & Associates purchased Swenson Granite Work’s larger slabs and shaped them to look more irregular on site. He also used some skin slabs from Swenson – the outside slab cut from our block of granite when it comes out of the quarry. Putting the Woodbury Gray granite chimney cap together was also a challenge. It is a 4-piece cap measuring about 17 ft by 9 ft. Each piece needed to be the same thickness with matching finishes so that it appeared to be in one piece when formed. 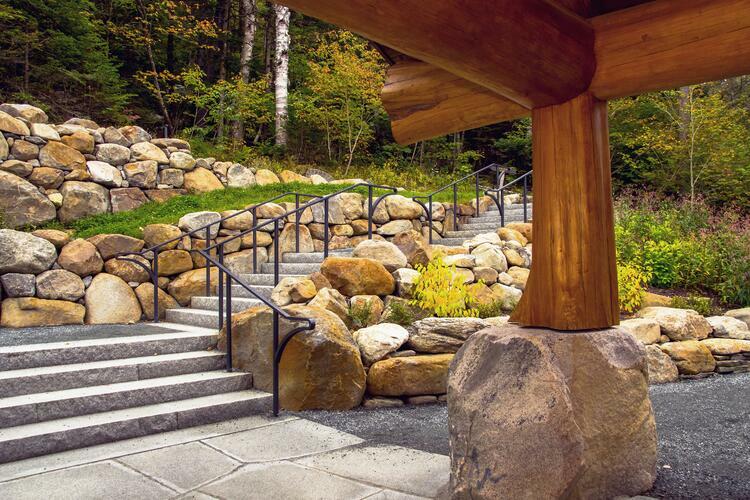 Interested in learning more about the granite steps used in this project? Our steps and treads spec sheet will show you options for stone types, colors, sizes, weights, finishes and styles. Download here.